Plaza de Toros de Las Ventas in Madrid. Photo by George M. Groutas / Flickr. As they're running with the bulls in Pamplona, Glynnis MacNicol wrestles with the memory of watching her first bullfight in Madrid, where the toreador tradition is holding fast. MADRID – Many years ago, before the advent of the internet and the E.U., I went to the running of the bulls in Pamplona, Spain. I was nineteen at the time and two months into what would turn into a three-month backpacking trip across Europe. I am oh, so sorry to admit my only knowledge of San Fermin at that time came from the opening scenes of movie City Slickers. But everyone we'd met up with on our trip seemed to be heading that way, so we opted to tag along. The sum total of my memory from those five days spent in Pamplona — during which time homebase was a shoddy tent amidst an impromptu VW van camp set up outside the city limits where we bathed (sometimes fully clothed, why waste extra time and soap on laundry?) in a nearby river — consists of my watching the hooves of bulls pound by on their morning run through the street through the gap underneath the barricades from where I was lying on a sidewalk recovering from a night spent parading through the streets (literally) imbibing a bottomless bottle of Sangria. Oh, to be 19 again. Even so, I never forgot the electricity of those hooves barreling by. Fifteen years would pass before I returned to Spain, during which time I developed a devotion to most things Hemingway (recently very much put to the test by HBO's woeful Hemingway and Gellhorn). 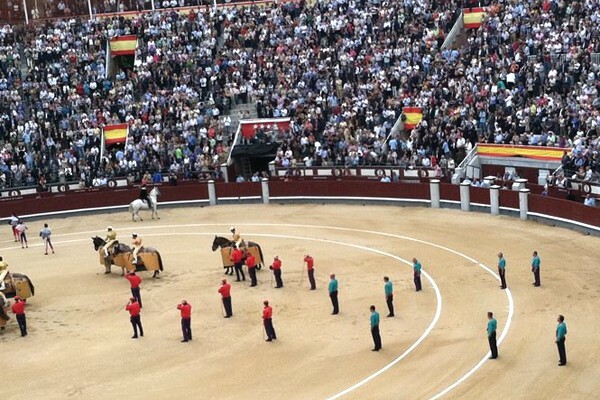 Subsequently on a trip to Madrid with a friend last spring, I was eager to attend the bullfights, which luckily happened to be in high season while I was there. Hemingway once wrote of the bullfights in Spain that it is "impossible to imagine the emotional and spiritual intensity and pure classic beauty that can be produced by a man, an animal, and a piece of scarlet serge draped on a stick." 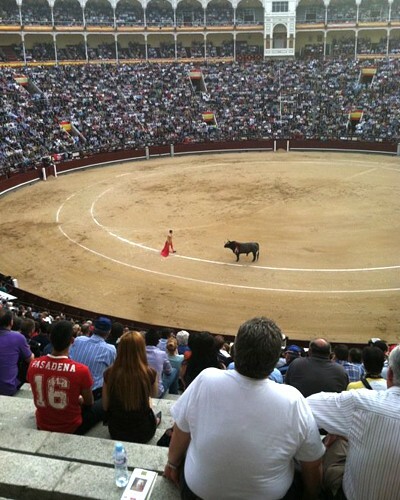 The scene at Las Ventas as seen from the author's seat. All photos in the story by Mauri Weakley. To be sure, it quickly became clear that I was utterly unprepared for how shocking and engrossing the experience would be. But mostly I was unprepared for how new it would be. Wholly new experiences are not easy to come by these days — especially in the age of digital accessibility — and even after multiple readings of The Sun Also Rises, seeing the fights in person involved a resolve one does not normally associate with sporting events. The sport of bullfighting is not easy to justify these days, even in the parts of the world where it is considered a cherished tradition. In 2010, the long-held tradition was banned in Barcelona altogether, and across Spain the number of fights have dropped by a third. But Madrid is still a stronghold. And judging by the crowds outside Las Ventas stadium when I attended on a warm Thursday night in May, it is not disappearing anytime soon. Perhaps then it shouldn't be a surprise to hear that tickets during the high season can be hard to come by. We snagged ours from a hole-in-the-wall vendor on a tiny Madrid side street during a two-week long festival. Word to the budget-wise: If you can, aim to go on a cloudy day. Tickets for the seats in the half of the stadium which receives direct sunlight are significantly cheaper than those in the shade. At first glance, attending the bullfights is a bit like attending a sports event in the United States. There is a similar level of and casual joviality. From a distance, Las Ventas is not all that different from Yankee Stadium as seen from an approaching 6 train. The crowd that night was mostly local, and it was clear even to a non-Spanish speaker (i.e. me) that, as with every sport, to a certain chunk of those milling outside this was very serious business. As Hemingway readers will know, these people are referred to as aficionados. We attended on a Tuesday night, and to my eye we were the only tourists there. A rarity at any event in Europe. Instead of vendors selling team paraphernalia, there were candy stands where you could buy bags of sugary treats in bulk. The brightly colored childlike offerings were so at odds with the gruesomeness we had paid to behold that as we milled about I'd momentarily forgotten what we were there to see. When I remembered, my stomach turned. Admittedly, there not a whole lot of events (barring weddings, and public executions popular with the Taliban) where one has to work up the nerve to attend, but from the time we entered the gates to the end of the first fight I spend not a little energy wondering if I'd be able to handle the spectacle to come. For Hemingway, fresh from the horror of World War I, the bullfights were a way to understand death better in order to write about it well, a choreographed and controlled tragedy. These days, the ritualized killing possesses a sort of gruesomeness few of us in the modern world are forced to confront in our daily lives. The whole spectacle utterly contradicts our general Western values. Namely, that we should not inflict unnecessary cruelty, and if we do it should be kept out of our sight and certainly not enjoyed. And yet herein lies the fascination — and, to a certain extent, truth — because animals get killed for our benefit all the time, everyday. It's just that we no longer have to witness it. At least, this was loosely what was going through my mind as we followed the crowds through the turnstiles into the inside of the airy stadium where vendors were renting out simple seat cushions, an offering that mystified me until I went through my designated gate and into the sunny stadium and realized there were no seats, just basic stone steps around the perimeter of the stadium that had been marked with paint to delineate seats. Ahead of the first fight — there are traditionally six per night — there was a moment of silence for the victims of the earthquake in southern Spain earlier that week followed by riotous applause. It made for a strange juxtaposition against the carnage that was to come. Then came the colorful picadors who entered the ring to the ritual sounds of the small brass band, then a hush as the angry, powerful, but also vulnerable bull trotted into view, his fate already sealed. 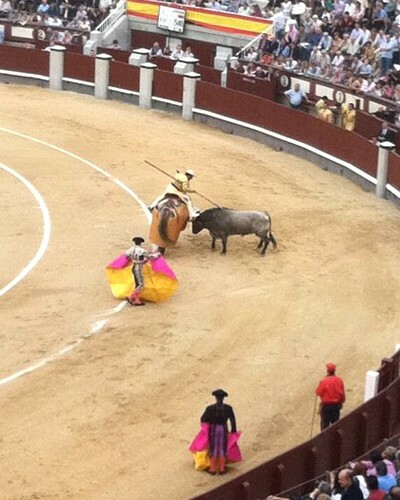 Even if the toreador was injured or killed, someone would come out and finish the bull. A note on that applause: Unlike American sporting events, what is deserving of applause at a bullfight is a good fight, whether it be from the bull or the bullfighter. To wit: On the night I attended, two bulls displayed such levels of bravery and aggression that members of the crowd threw their hats in the ring as the dead carcasses were dragged away by the horses. Meanwhile, the bullfighters who had finally conquered them received only hisses and whistles. Hemingway talks a lot about what makes a good bullfight in his tome Death in the Afternoon, but, based on what I could glean from the twenty-something Spaniard sitting next to us whose choppy English generously guided us through the proceedings, the closer the bullfighter got the to the bull and the more central his aim, the better he was considered. Likewise, the more "courage" the bull demonstrated, especially after being lanced the first few times, the higher the admiration from the crowd. A bad bull, we were told, ran slowly and scooped with its horns. It took the first three fights before I was able to watch things unfold without feeling sick and wanting to cover my eyes. And even then, every time the bull went for the horses my stomach dropped. (The horses wear padding and apparently aren't hurt, but still!) By the fourth fight however, I'd begun to adjust, and the choreography and skill of what was going on became clearer. And I'd be lying if I said there wasn't some sort of strange thrill to be had (endured?) every time a bull shuddered and fell to its knees, the final spasm of death clear even from the top row of seats. By the time I left a few hours later, I was hooked on the entire spectacle. To be sure, it's very possible the machismo and the gruesomeness of it all would eventually get loathsome had I the opportunity to attend regularly. But on this occasion, what grabbed me most powerfully was this open accounting of death, something we strive so mightily to remove all evidence of in our North American culture. Boy, did I feel alive as I peeled myself off the concrete at the end of the last match. And drained. And much deserving of the many drinks we quickly sought out. 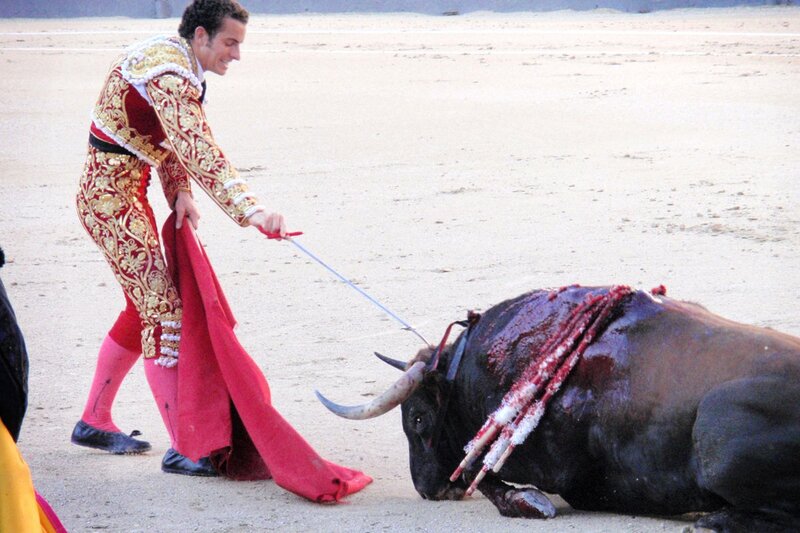 Bullfighting is a dying sport, no pun intended. Last year it was officially banned in Barcelona, and the sense is its practice will not be long even in strongholds like Madrid and Granada. There is no longer the collective stomach for it. Even from my vantage point a year later, I'm a bit repulsed at my own enjoyment of it. Even so, I was thrilled. There is nothing else quite like it on the planet. And that newness alone was worth the stomachache. Glynnis is a writer who covers media and politics (the other bloodsports) and co-founder of The Li.st. You can follow her on Twitter at @GlynnMacN and @TheList. She travels for the view.